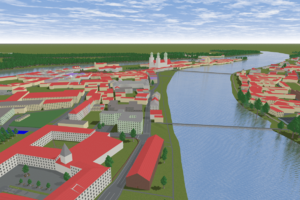 OSM2World is a converter that creates three-dimensional models of the world from OpenStreetMap data. It can be used as a stand-alone tool, on a server or as a library in Java programs. Of course! OSM2World is published as Open Source (LGPL) and can be used for free, even in commercial software. Head to the download section. Be warned, though, that OSM2World is still in the early stages of its development. If you just want to take a quick look, check out the isometric 2d slippy map demo.